Here’s a question that anyone should be able to answer. What happened in Rome on 10 October 1582? While you try to work it out, I’m going to tell you a little story. 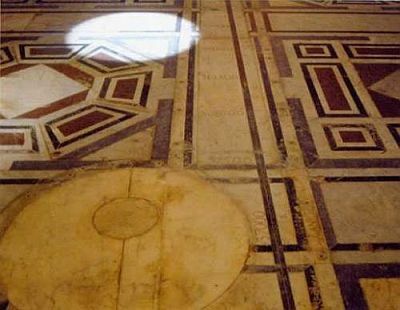 It’s about the solar clock on the floor of Milan’s cathedral, which my father showed me when I was a boy. It’s a thin bronze strip of that runs through the floor of the left nave and climbs up the lower section of one of the walls, lined up with a hole on the façade of the church. Every day at midday, the sun shines through the hole and crosses the strip. This indicates both the time of the day – midday, evidently – and the day of the year, as measured by the point of the strip that is illuminated. These kinds of clocks work better if the hole that the sun shines through (or gnomon) is positioned quite high, which is why historically in Europe they were often located inside cathedrals. The gnomon of the cathedral in Milan – which is a very late one (1786) – is placed 24 metres up the façade. 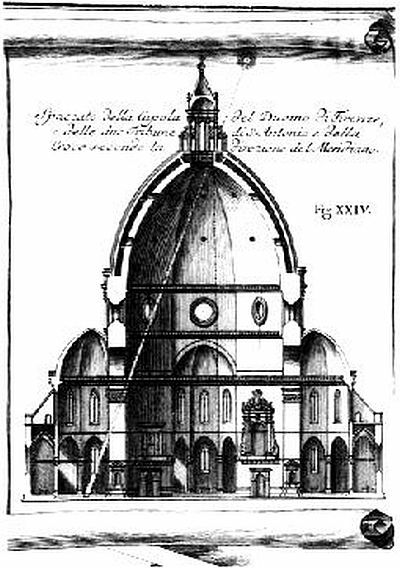 Whereas the gnomon of the solar clock in Santa Maria del Fiore, built in 1468, is the highest in the world, being drilled into the very drum of Brunelleschi’s famous cupola, 90 metres above the cathedral’s floor. Would it help if I told you what happened in Rome on 10 October 1582 is also what happened in Stockholm on 25 February 1753 and in a small town in Russia on 16 February 1923? I think it probably would. It may seem counter-intuitive to claim that the solar clock of the cathedral in Milan tells time, since the only time it tells is midday, but this – and not the calendar part – was in fact its primary function: a law enacted on the year the clock was installed required Lombardy to adopt so-called ‘French time’, which marked the beginning of each day as the ‘true’ solar noon, instead of the traditional bell chime for the vesper prayers, shortly after sunset. The solar clock in Santa Maria del Fiore, by contrast, may initially strike us as rather less useful. For one thing, the sun beam hits the floor of the cathedral for a small portion of the year, from late May to late July, again on either side of the true noon. I said the hole was drilled into the cupola, before, but it’s not quite true. It sits on a small bronze plate inside one of the windows, and it has a diameter of about two centimetres. From there, the beam – which by the time it reaches the floor has become a fairly sizeable circle – hits another graduated strip, and on certain days superimposes itself on one of two finely drawn circles. What happens if you track the position of the sun from late May to late July is that you’ll be able to time with absolute precision the summer solstice (or the winter one, if you’re in the Southern hemisphere. But let’s stick with Florence.) A Florentine living in those times wouldn’t have cared one little bit to know when midday was, but they would have cared a lot about the timing of the solstice. If you know when the summer solstice is, then you know when the 21st of June is. If you know when the 21st of June is, you can count the days backwards and forwards for the entire, ‘true’ solar calendar. And if you can mark out the solar calendar, you can establish the correct date in which to celebrate Easter. I used to find it quite curious, that we celebrate the birth of Jesus on a regular fixed birthday, whereas his death and resurrection fall on days that change from year to year. This is obviously a relic of a different, ancient way of measuring time and anniversaries, from a time when the solar and lunar calendars were intertwined. As decreed at the council of Nicea of 325 CE (when it became decoupled from its Jewish counterpart), the Christian Easter falls on the Sunday following the first full moon of Spring. To know when Spring begins, you need to know when the Spring equinox falls. And for that you need a reliable solar calendar. You all know what happened here: the calendar used in Christian Europe had been established by Julius Caesar, who did a reasonably good job of accounting for the fact that the solar year does not last a round number of days. But even so, over the span of fifteen centuries the Julian calendar had started lagging quite badly, which led to Christians celebrating their holiest of days at a noticeably wrong time of the year. Hence the need to start measuring the ‘true’ position of the sun via devices such as the clock in Santa Maria del Fiore, and to create a new, more precise calendar. 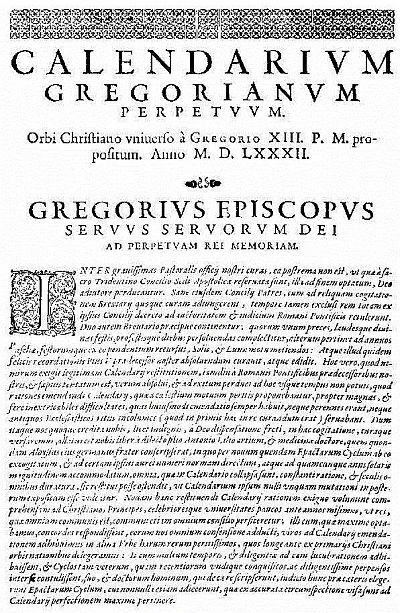 Enter pope Gregory XIII, who asked his scientists to study the problem and published the solution in a decree (or ‘bull’) known (as per the custom) by its opening words, in this case ‘Inter gravissimas’, or ‘Among the very serious matters…’. The sentence continues: ‘…entrusted upon our pastoral office, not the least is to see to it that the tasks which the holy Council of Trent reserved to the Apostolic See are conducted, with God's help, to a desirable conclusion.’ One of those tasks concerned precisely ‘the annual recurrence of Easter and the feasts that depend on it, to be measured by the movement of the sun and moon’. So, to answer our initial question: nothing. Nothing happened in Rome on 10 October 1582, because the day never existed. In Rome and in all the territories under the direct control of the Pope, Thursday, 4 October 1582 was followed by Friday, 15 October 1582, in order to make up for the time lost by the Julian calendar. Interestingly, the Bull also specifies how the celebration for the saints honoured in those missing ten days were to be rearranged for that particular year, as well as setting new rules for the 28-year cycle of the so-called ‘Sunday letters’ which helped to locate Easter and every other ‘moveable feast’ (I didn’t know the origin of that expression until I looked it up just now). This package – the rules for the new Gregorian calendar, plus the ‘martyrology’, or list of martyrs, which I assume means in this case which saints were celebrated on which days – was to be printed exclusively under license by the Holy See, under the penance of a fine of 100 gold ducats plus forfeiture of the publications (in territories controlled by the Pope) or excommunication (in the rest of the world). Given the difficulty in delivering the Bull ‘to all Christian places in the world’, it was decreed that it would be affixed to the doors of the Basilica of Saint Peter’s in Rome and displayed in Campo de’ Fiori, the square where 18 years later Pope Clement VIII would have Giordano Bruno burnt alive at the stake. The new calendar was adopted almost immediately by Catholic countries and territories, and with various delays by Protestant and Orthodox countries (as hinted above, for instance, Sweden made the switch in 1753, the Soviet Union in 1923). The history of how the Gregorian calendar spread throughout nations that had never been touched by Christianity and became truly global – along with the adoption of 24 time zones starting at the Prime Meridian in Greenwich, London – was driven by very different factors and is told in a book by Vanessa Ogle entitled The Global Transformation of Time, which I warmly recommend. As for the solar clocks in those old churches, they tell time from a different era, as if the sun that shines through those holes and onto those floors were still trapped in the Renaissance, or the Baroque period, reminding us that human time, too, has a history. I can’t recall if it was an ad by Taboola (probably) or an ad by Outbrain (I think it was an ad by Taboola). Either way, I clipped it along with the page it linked to, because surely I would have to revisit this. What goes by the very misleading name of native advertising – one might as well call it ‘indigenous lying’ – is one of the most insidious elements of our current media age. We’ve all come across them, including on reputable sites such as the Guardian and the New York Times – the very people who have pledged to defend us against the scourge of fake news. Following on from stories that, if not always accurate, at least come with a number of explicit and implicit editorial guarantees, and subtly mimicking the almost universal design of web news content, these ads introduce themselves as ‘recommended content’, as if the recommendations came from the sites themselves. Indeed, sometimes they are actual stories from reputable and traceable sources. But more often they are not. If you click, as I have, on the link under the stock photo of an elderly lady touching her face you will land on a page where a video starts to play automatically. This is a standard infomercial such as you may see on television, but it’s not playing on television. It’s playing on your computer, perhaps as far as New Zealand, across boundaries both electronic and geographic that make what little consumer protections are still in place in the country of origin (in this case, the United States) utterly ineffective. 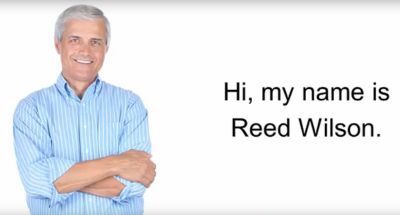 The terrifying lines (which would surely get a doctor instantly fired) are delivered in the video by a reassuring, silver-haired man who goes by the name of Martin Reilly, supposedly a science teacher from Stamford, Connecticut, but almost certainly an actor. He proceeds to tell us the sad story of Sandra, his wife, a victim of early onset dementia, while promising that ‘in the next few minutes’ he will reveal to us the ingredients of a simple plate of food that can cure Alzheimer’s disease. He won’t. And the video – which you cannot fast forward nor rewind – doesn’t last a mere few minutes, but an exhausting seventy, by the end of which the dish has become a 21 day ‘protocol’ for you to purchase, none of whose ingredients are revealed, save for coconut oil. 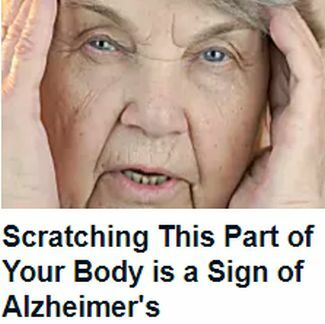 Nor does the presentation contain any information whatsoever on any parts of the body that, if you scratched them, it would be a sign of Alzheimer’s. That detail is just quietly forgotten in the time it takes for you to click on the link. While the roots of the videos are to be traced in informercials such as those that landed Kevin Trudeau in jail, the context in which they can be consumed has changed, making them more persuasive. There are fewer signals that the video playing on your computer screens is in fact an advertisement, more ambiguity about the source of the information and its demarcation from the page that landed you here – perhaps the Guardian or the New York Times. Messages get jumbled together. And while the web can be a place where to test the claims made in an infomercial, it can also be gamed in order to reinforce it. For instance, if you research the memory research protocol you will find pages with promising names such as ‘memory-repair-protocol-review’ which are in fact long advertorials, complete with customer testimonials and links for purchasing the product. The literacy required to separate these fake reviews from real reviews is not insignificant, and remember: it was a trusted news source that led you here in the first place. Going over the claims made by ‘Martin Reilly’ (more on his identity in a minute) would take too long, but the story spun during the video is worth a quick summary: while visiting a nursing home as he and his wife prepare for the inevitable, Martin follows a delicious smell of food into the kitchen where an Indian lady of 107 is cooking her meal. I come from a town called Ballabgarh, she explains, and if you Google the name you’ll know why my mind is so sharp. Sure enough, Ballabgarh is is touted in a BBC report as the ‘Indian village may hold key to beating dementia’, on account of its low rates of the disease. 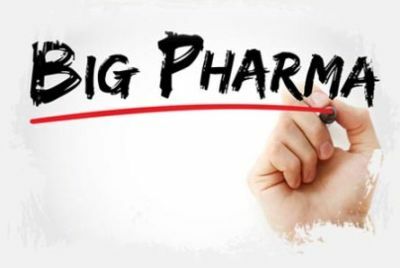 Following this discovery, Reilly launches in a crusade to self-fund research into the local diet, which Big Pharma forbids universities to look into so it can continue to sell billion dollars’ worth of drugs that don’t stop the disease. Finally, Reilly meets Dr Miles Fielding from Unnamed University, a ‘specialist in neuro chemistry and brain function’ whose name returns zero results in Google Scholar for papers in this field, and after much experimentation the pair develops a 21 day diet that not only stops the advance of the disease in Martin’s wife Sandra, but reverts it completely. Now Reilly is willing to share these secrets with us in a package that – and this is by far my favourite part – does not cost $997. It costs less than that. As a matter of fact, Reilly would not even bother to sell his memory protocol, if not to pay for the cost of running the website, and to deflect the repeated but always unspecified attempts by Big Pharma to silence him. If you try to purchase the Memory Repair Protocol in book form through Amazon, it lists as the author not Martin Reilly but one Brian Wilds, whose current catalogue includes Lost Ways: Spy Secrets that Can Save your Life, and whose past catalogue boasts such titles as Flat Belly Overnight and Lean Belly Breatkthrough. 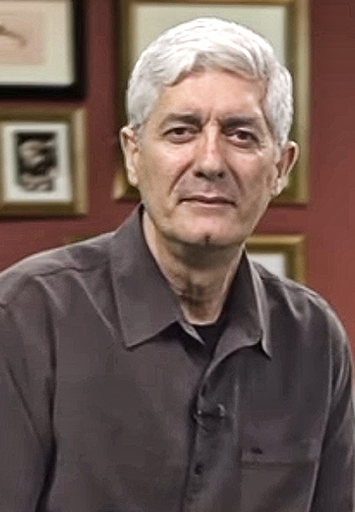 While if you keep looking for reviews of the product you'll stumble upon a Diabetes Loophole package which is nearly identical in design to the Memory Repair Protocol, and is identically advertised, making similar quasi-scientific claims, retailing for the same price through the same secure banking platform, and hawked by its own stock silver-haired guy. This information may be enough to stop you in your tracks, instead of spending less-than-$997 on a recipe book of dubious value, but then it depends on just who you are. You may in fact be vulnerable, or desperate, or grieving for a loved one who is still alive but doesn’t know your face. 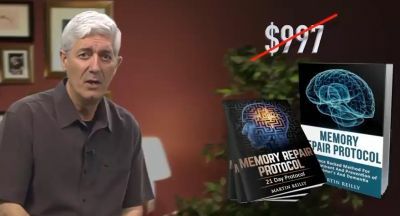 It’s a common enough condition, even among people who possess otherwise sufficient literacy to disbelieve and disprove the claims of the Memory Repair Protocol. And for all of these people, there is little protection, or hope of redress beyond the 60 day money back guarantee, which hardly makes up for the pain of being duped on top of the misery of living with a cruel and incurable disease. I told this story before. Whenever my father was asked for directions near his place of work, in the part of Milan where he was born, he would tell motorists to either turn at the bridge or continue straight after the bridge or similar, which would have confused them greatly since this so-called bridge was removed and the waterway it crossed paved over in 1930, four years before my father was born, and you could guess its past existence only by virtue of a slight slope in the road. But when my father was growing up everyone still called it the bridge and so he kept calling it the bridge, and maybe he even saw it in his mind, that bridge that was removed four years before he was born. He certainly knew where the old rivers where, even if you could barely see them underneath the modern city. A city is sculpted by time, by the movements of people, by changes in labour relations and the economic base of the community. And it is sculpted by social relations in all their forms, including political relations, which are governed but not completely determined by those other factors. In Wellington, as of last week, we can access this particular layer of the city’s history thanks to the Walking Radical Wellington app, a project created by Dougal McNeill and Samantha Murphy and supported by the Faculty of Humanities and Social Sciences of our main university. So I downloaded the app and went on the walk. If you’re not familiar with these kinds of apps, they are generally overlaid on mapping software such as GPSMyCity or, in this case, PocketSights, and connect a series of location that are annotated with text and pictures. Walking Radical Wellington features 28 such locations, connected in spatial as opposed to chronological order. The two main thematic criteria are sites of working-class and socialist struggle, and sites of organisations of the LGBTQ community alongside what the authors call the ‘social spaces and outlets whether private lives of individuals could find public expression’. This network of clubs, venues and private dwellings, stretching mainly from Cuba Street to Willis Street, is perhaps the most surprising and vivid aspect of the walk, conveying the sense of a secret Wellington that struggled for recognition and ultimately liberation. The walk can be disorienting, because it takes you backwards and forwards in time, and also because some of the old physical markers have been erased over time by new leases and successive redevelopments. Often you will look for a street number, and find that it has disappeared, as if crushed between the neighbouring addresses. 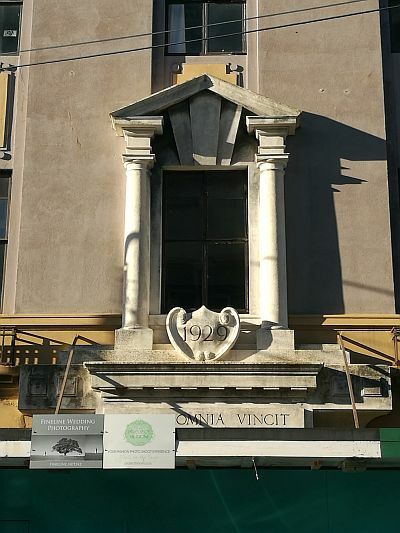 You may be searching for the original site of the Resistance Bookshop at 144 Willis Street, for instance (location #18 on the walk), but the numbers jump from 136 to 148. You are standing right there, but there isn’t there anymore. Similarly, you could say that the workshop of Philip Josephs – the anarchist tailor whose life is chronicled in Jared Davidson's brilliant book Sewing Freedom – is now a Sunglass Hut, but only more or less: the actual building is long gone. Yet there is value in those spatial relationships, even when they connect places that have physically disappeared or morphed beyond recognition. The walk tells a story, through flash backs and digressions, and the space in-between the stops is the time it takes for the story to be told. Linear time is replaced by space, or rather displaced into another form of time: the time of walking from one location to another. The authors are careful to point out that the story of radical Wellington they endeavoured to tell is one of many possible stories, dictated by their particular political interests and knowledge as well as by certain constraints such as how far people could be expected to walk in a single outing (this is why, for instance, an obvious set of locations such as Newtown was left out). One thing the walk explicitly isn’t, is an attempt to map or connect places of current activity and struggle – a fact that was made obvious to me as I passed the social centre at 128 Abel Smith Street twice in the early stages of the walk. And what it perhaps most notably isn’t – again by explicit disclaimer – is ‘an attempt to capture the history of Māori political activity in Wellington’, which McNeill and Murphy felt ill-equipped to tell. There, I think, lies the most immediate opportunity for a companion or sequel that might go even further in illustrating how much place matters to our politics. I really enjoyed the walk, and found it delightfully instructive. 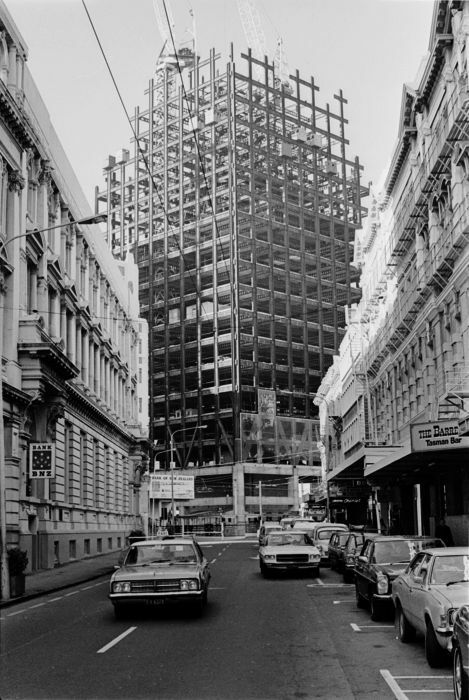 And not just because of the many things I didn’t know – for instance: about the industrial disputes during the construction of the State Insurance, formerly Bank of New Zealand building that towers, Death Star-like over the CBD, and where I worked briefly after moving to Wellington. Individually, those are just interesting stories. But woven together, they form a lineage, a heritage. Walking Radical Wellington didn’t speak to me of lost utopias or romantic pursuits, but rather – much more compellingly – of the concrete signs of a collective history that is never finished or exhausted, but can be retraced, and brought back to useful life. 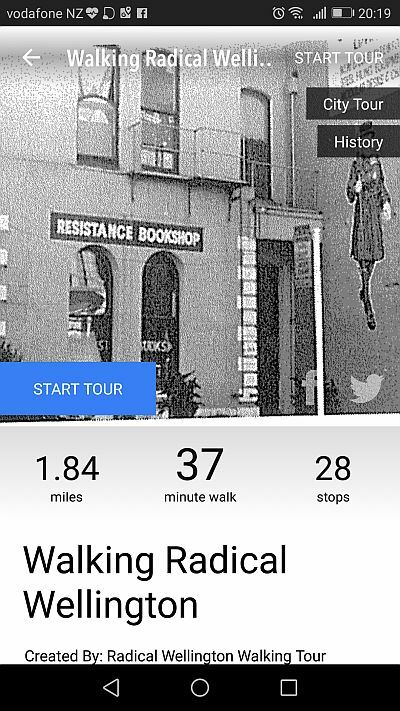 You can download the Walking Radical Wellington app for iOS or Android from the project's web page. When I was a small child, I thought there was a man who lived in a flooded house, with the water coming up to his chest. But he was very neat so he always dressed up, although he also got his shirt badly stained. This man was known as l’uomo in ammollo, the soaking man. The soaking man was always going on about this bet he made with his wife. His shirt was very dirty. Wine, tomato sauce, grease. Such stains were once impossible to remove. But not anymore, thanks to a laundry detergent called Bio Presto. 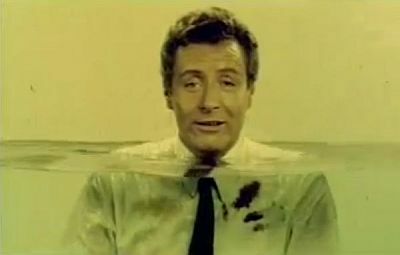 Soon the original soaking man was replaced by a new soaking man whose name was Franco Cerri. He featured not only on the television ads but also in full colour in magazines. The soaking man entered hour homes every night during Carosello (literally ‘Carousel’), a popular prime time show consisting solely of advertisements, mostly in the form of skits of varying duration. Some of these recurring skits are classics of Italian entertainment, including the wonderful La Linea, a character that starred in a series of stand-alone cartoons but was mostly known for his role in advertising Lagostina pots. The comedy of Carosello was often of the surreal variety. But nothing was quite so strange – to me at least – than the soaking man. Why was this man submerged? Where did all the water come from? What did soaking man do all day? 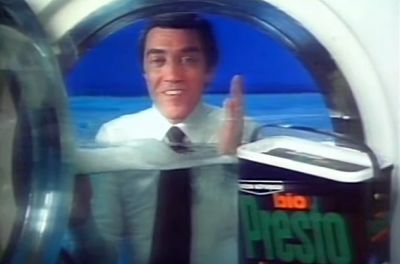 Bio Presto was a detergent for your hand-washing. But later they introduced a variety for washing machines. There was a big generational gap in Italy when it came to washing machines, and I caught the tail end of it. Older women didn’t trust them. My mother bought my grandmother a washing machine. But my grandmother only used the washing machine when my mother came to visit, every second weekend. Otherwise, she washed everything by hand in the big stone laundry basin at the back of the house. I know because sometimes I spent the week there, especially in summer, in-between parental visits. The sloping front of the stone laundry basin featured a sculpted surface with dents that acted like a washboard. My grandmother didn’t use Bio Presto though. She used big square blocs of Marseilles soap. She trusted Marseilles soap. The soaking man was trying to sell to Italian housewives a more technologically advanced form of handwashing. Bio Presto isn’t a laundry detergent, he explained. It’s a bio-detergent. It washes clothes biologically. 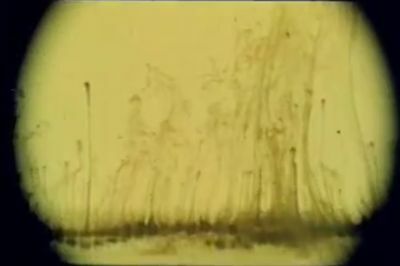 The television ads included an animation showing how the enzymes of Bio Presto lifted the stains off the material, which greatly fascinated me. 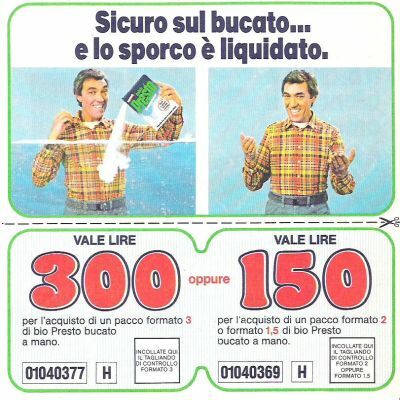 The slogan of the ad campaign in all its iterations was non esiste lo sporco impossibile, there is no such thing as a stain that won’t come clean. 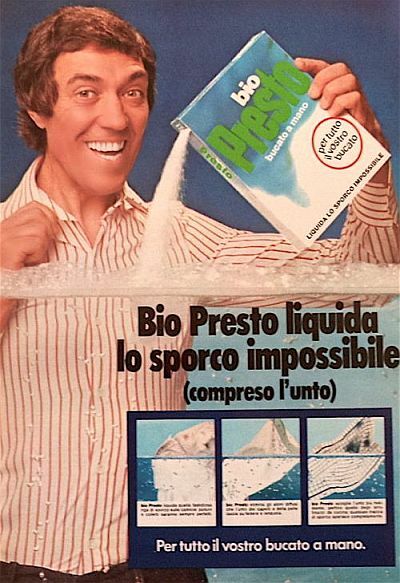 When they introduced the version of Bio Presto for washing machines, in the late 1970s, the ads became even stranger. The soaking man lived inside the washing machine now. But I was older so I was less fazed. Good on the soaking man, I may have thought. The most famous soaking man was Franco Cerri who – this is also quite strange – was one of the premier Italian jazz guitarists of the last century. He’s still alive, actually. He’s 92 years old. During his very long career, he played with Chet Baker and Billie Holiday, with Dizzy Gillespie and Sarah Vaughan and Stéphane Grappelli, with Buddy Collette and Gorni Kramer, who discovered him in a club in Milan in the late 1940s. But true fame came to him via television. Carosello had an audience of 20 million. Half the country. For at least two generations of Italian children, bedtime was 9pm, or ‘after Carosello’. 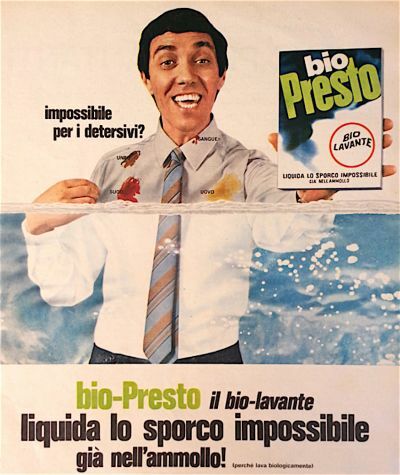 So everyone knew the soaking man and the ‘little man of Lagostina’ and all the other characters that populated those ten minutes of nightly television – every day of the year, except for Good Friday and the 2nd of November – all paid for by commerce, and often by multinationals (Bio Presto is a Henkel product). All so they could sell us groceries. I don’t feel the slightest bit of nostalgia. But if I think back quite hard I can briefly reach for the sense of bafflement I felt whenever I thought of the man who lived in a flooded house.